Edge tape or also known as vibration damping strip (VDS) is a thin rubber specially treated for bonding. The edge tape is approximately 200 microns (0.2 mm) thick, and it is often used in composite structures to prevent the layers from separating and sometimes to enhance damping properties. 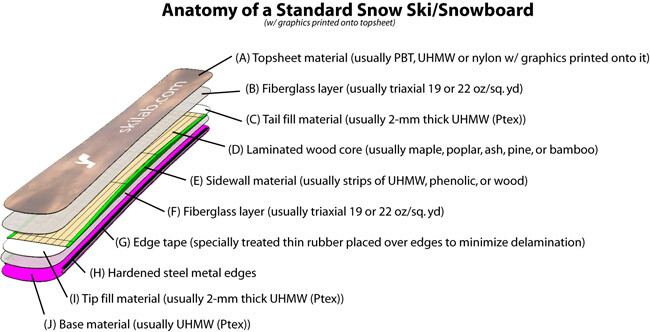 In the case of skis and snowboards, it is typically applied in between the metal edge and fiberglass layer to minimize delamination as the ski/snowboard flexes. It is incorrect to think of the edge tape used in this specific application as a damping element since when used this way the tape does not show any measurable damping enhancement. However, when combined with other materials and designed and placed in other areas of the ski/snowboard, damping may increase. The edge tape should always be handle with gloves and kept in a sealed plastic bag and away from UV sources to minimize degradation of the material. The edge tape available from the Ski Lab is high-quality material and available in two widths: 20 mm and 150 mm. The 20-mm wide edge tape is often used between the metal edge and fiberglass layer to minimize delamination. The wide 150-mm edge tape has been used in the tip and tail area to minimize delamination as well as combined with other materials such as metal and strategically placed to enhance damping.